Add a Dining Area – During the milder months, the employees and even visitors of your tenants can enjoy an outdoor lunch break around an installed bench and table or an umbrellaed one. Create a Zen or Wall Garden – Not only aesthetically pleasing but also relaxing, small gardens give your tenants a place to get away from the stress of the office or to place a phone call. Install a Sculpture or Water Feature – Similarly, these types of features will attract better clients for the tenants, better clients for the landlord and ultimately increase the value of the property. For more information on the potential benefits of commercial landscaping for your property, please visit us online at OutdoorExpressions.net or phone us directly at 888-210-1116. Outdoor Expressions – Make your outdoor space a place to remember. 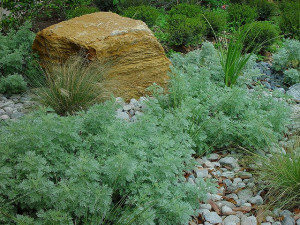 Install a Xeriscape – Lawns in the south and the southwest can be especially difficult to maintain especially when a water shortage goes into effect. Xeriscapes–landscapes comprised of drought tolerant plants–are an excellent way to add floral beauty while minimizing water demand. Rocks and Water are Nice Too – For those who demand a truly maintenance-free lawn, consider installing a water feature surrounded by a rock landscape – beautiful with no worries. Try Dramatic Decking – Whether concrete, wood or crushed stone, decking provides an almost maintenance free area. For a little greenery, just add several pots or a trellis or two. 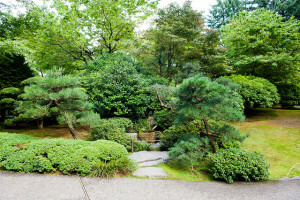 For more information on xeroscaping in particular or on creating the perfect outdoor space in your Atlanta home in general, please visit us online at OutdoorExpressions.net or phone us directly at 888-210-1116. Outdoor Expressions – Make your outdoor space a place to remember. Many novice, home gardeners in Georgia consider the winter months to be a time for relaxation with little need to consider the requirements of their gardens and other landscape areas. More experienced gardeners realize, however, that the height of the winter season – January – is the ideal time to start preparing for the spring. 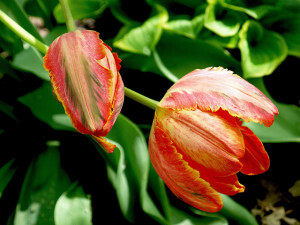 Plant Bulbs – As long as the ground is not frozen, bulbs can be planted. If the ground is frozen, consider placing some in pots but keep them indoors. Either way, you will gain some much needed color at the beginning of the next season at an affordable price. Do a Thorough Cleanup – Many experienced gardeners will leave a layer of leaves, twigs and other detritus on the grounds of their garden to add an insulating layer. Now, with the worst of the winter weather over, it is time to remove this eyesore. 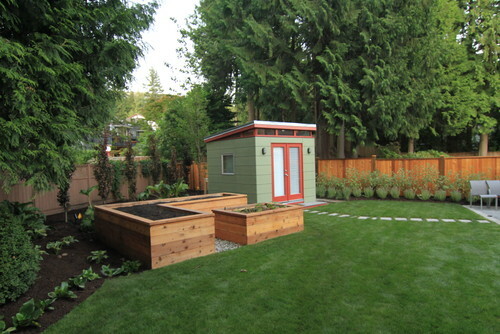 For more winter gardening tips, please visit us online at OutdoorExpressions.net or phone us directly at 888-210-1116. Outdoor Expressions – Make your outdoor space a place to remember. While most homeowners envision a landscape architect as someone who only designs parks and gardens, they should also understand that these professionals are experienced in the design of exterior residential spaces as well. In addition to the horticultural plantings around your home, a landscape artist can also help with the design of such things as pathways, fountains and swimming pools as well as help with stormwater management. In short, hiring a landscape architect means getting a thoroughly trained and licensed professional with lots of pertinent experience. 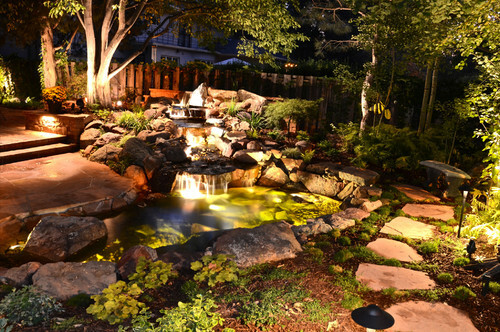 A landscape architect can take your project from design to finish. The result will be an outdoor space that is not only aesthetically pleasing but also eminently functional. In fact, your outdoor space will not only be usable now and for years to come but will only grow more beautiful as the plants, shrubs and trees mature. For more information on the very real benefits of hiring a landscape architect or a commercial landscaping firm in Atlanta, please visit us online at OutdoorExpressions.net or phone us directly at 888-210-1116. Outdoor Expressions – Make your outdoor space a place to remember. Add String Lights – While especially applicable during the holiday season, white string lights still add an elegant touch at other times of the year too. Install Wicker Pendants – For a more exotic and natural look, consider hanging wicker baskets with installed pendant lighting around your yard. It’s also easy to move the lights if needed. Use Umbrellas – If the whimsical touch is more to your taste, standard umbrellas suspended from wires with ordinary light bulbs underneath provides shelter as well as an undeniably different look. For more information on the latest trends in fire pits or if you are already in search of an Atlanta landscape designer, please visit us online or phone us directly at 888-210-1116. Outdoor Expressions – Make your outdoor space a place to remember. The Traditional Pit – This circular raised pit that is surrounded by wooden benches or stone seats never seems to go out of style. It is perfect for entertaining guests or having a quiet night with the kids toasting marshmallows and making s’mores. The Outdoor Den – For homeowners who see more than their fair share of inclement weather, a firepit that fronts onto a covered area is probably best. Ensure that the pit is vented far enough away from the structure and that you also have a way to moderate the heat entering the space. 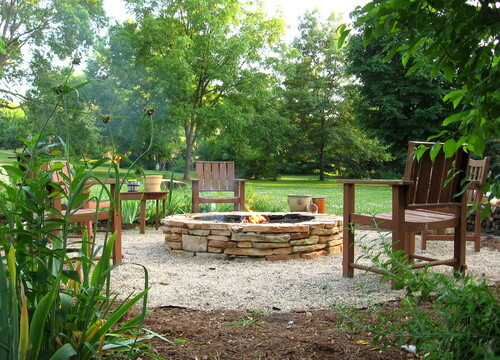 The Open Bowl – For a more intimate firepit that is also movable, consider using a small open bowl.